Some albums just ooze a singular atmosphere and vibe that transcend language or rational thought. 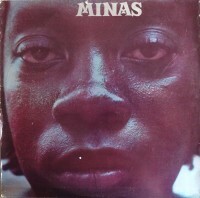 Milton Nascimento’s Minas is one of those albums. A Brazilian singer-songwriter who boasts a commanding, supple vocal style, Nascimento has collaborated with many prominent American and English musicians (Wayne Shorter, Paul Simon, Herbie Hancock, Quincy Jones, Peter Gabriel, Jon Anderson, Cat Stevens, and, uh, Duran Duran), yet his own records aren’t that well known here. But among the record-collector cognoscenti, he’s revered as something of a prog-folk-soul genius. You could think of Nascimento as something of a South American Tim Buckley, but even that doesn’t quite nail his special talent. My Brazilian import copy of Minas contains scant info about the recording, but maybe not knowing every detail of it somehow enhances the listening experience. Savor the mystery! Milton sings in Portuguese, a wonderfully musical language that has a warm, tranquilizing effect on me. He enlists a children’s choir on a couple of tracks, which is one of my least favorite ploys, but for some reason it’s not as cloying as usual in Nascimento’s hands. Much of Minas is deceptively beautiful; most of the songs here don’t immediately stun you, but rather over repeat listens their oddly alluring contours begin to make sense and trigger your pleasure centers. By the fifth listen, you’re convinced Minas is a classic song cycle as devastatingly moving as Buckley’s Starsailor, Joni Mitchell’s The Hissing Of Summer Lawns, or any of Scott Walker’s first four solo joints.